Falls Church, VA–The Culmore Community Youth Collaborative (CCYC) will hold a fundraising and community outreach event Thursday July 31 from 6:30-8:30 pm in Suite 100, First Floor, Region 2 Human Services Building at 6245 Leesburg Pike Falls Church 22041. The CCYC is a collaborative of community stakeholders working together to share ideas, expertise, and resources to meet the needs of youth and resolve issues this population faces in the Culmore Community of Falls Church. The purpose of the CCYC event on July 31st is to raise funds and recruit volunteers needed to continue providing supervised academic and social support for middle and high school students in the Culmore community while they are out of school due to suspension. Such a program has operated in Culmore for the past two years with federal funding through the Fairfax Partnership for Youth, Inc. Funding ended June 30, 2008. The CCYC has made saving Culmore support on suspension (SOS) a top priority. The CCYC identified saving SOS as a critical need after hearing police testimony that youth enrollment in Culmore SOS has prevented youth crime, school principal report that Culmore SOS has kept students up on their academic work and reduced the risk of school drop out, and parent and youth feedback that the supervised support they received while on suspension was critical to helping the student return to school. Dar Al-Hijrah Islamic Center is spearheading the effort with support and technical assistance form the Fairfax Partnership for Youth. For more information about FPY visit www.fairfaxyouth.org. For more information about Dar Al-Hijrah Islamic Center visit www.daralhijarh.net. The U.S. Department of Agriculture reported that over 35.5 million people in the United States live in households considered to be food insecure. Of these 35.5 million, 22.9 million are adults (10.4 percent of all adults) and 12.6 million are children (17.2 percent of all children). 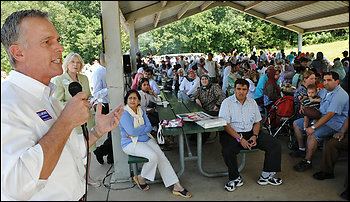 Each year, the Dar Al Hijrah Islamic Center in association with the Muslim American Society, makes an effort to fight hunger here in our country by providing thousands of pounds of meat to needy families and individuals by raising support and awareness of this problem on their annual Humanitarian Day. On Saturday, June 28th, the Dar Al Hijrah Islamic Center continued its tradition of community service and fighting against hunger by distributing over 300 meals to needy individuals and families. Additionally, the Dar Al Hijrah Islamic Center has a renown Social Services program which feeds dozens of needy families in the local community. Since its inception, the DAH Social Services program has provided food, clothing, prayer, counseling, and community referrals to those living in poverty. June 7th, 2008 from 10:00AM-2:00PM on the Dar Al Hijrah Islamic Center Campus.